Pectoral cross - A98-44 (with chain) - Istok Church Supplies Corp.
Clergy pectoral cross of an unusual shape of medium size is made of brass and covered with 24K gold-gilding, galvanized. The crucifixion is made using a special technology of applying a color image on a brass base, it is covered with a composition that protects it from mechanical damage and exposure to light. 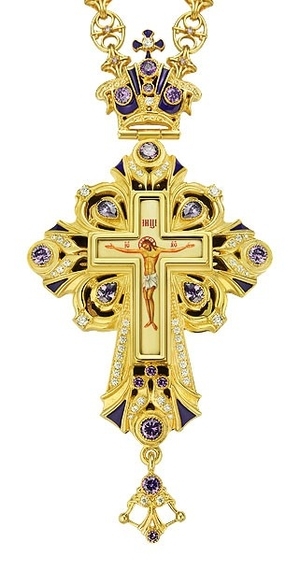 The cross is decorated with inserts of natural phianite stones and a small amount of enamel. The stones are fixed by hand, which guarantees their being in their places for the entire period of wearing the cross.